This date in 1569, Orthodox Metropolitan Philip II of Moscow was martyred for his opposition to Ivan the Terrible. He was elevated in 1566 as Russia’s top prelate* by that same Ivan, who soon regretted and then raged at his selection when Philip righteously withheld the church’s blessing from the tyrant in the midst of Ivan’s Oprichnina bloodbath. That was in Lent of 1568. Before the year was out Ivan, who did not fear to bully churchmen, had forced Philip’s deposition and had him immured in a Tver monastery. Safely out of the way there, the tsar’s fell henchman Malyuta Skuratov arrived two days before Christmas of 1569 pretending to bear a message. “My friend, do what you have come to do,” the monk replied. Skuratov strangled him to death. 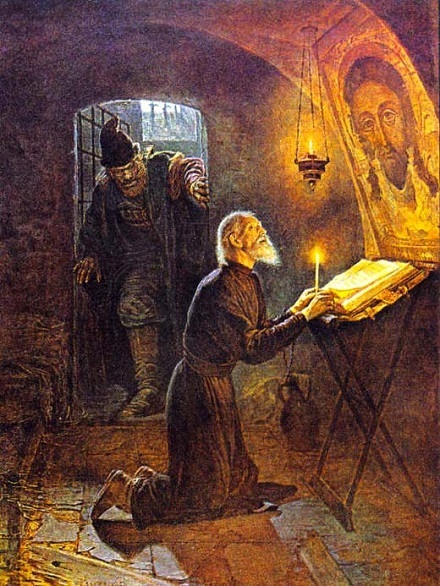 The Russian Orthodox Church observes this saint’s feast date on January 9. His relics are enshrined today at the Kremlin’s Dormition Cathedral. * Moscow did not become a patriarchate until 1589, so Philip did not bear that title.